It's time for another wonderful challenge over at Frilly and Funkie! This time Cec is our lovely hostess and she has chosen the theme MONOCHROMATIC. She would like you to create a shabby chic or vintage style project using only one colour and it's various hues. A little white for accenting is alright, but NO other neutrals are allowed! One lucky winner will receive a $25 gift certificate to Linda's shop The Funkie Junkie Boutique! I decided to do an anniversary card for my niece who was married on a beach in Jamaica last year. I thought a nice blue card with some Summer Waves would maybe take her back to that day, just for a minute or two. I actually ordered some pretty white sand dollar shells, but they didn't arrive in time to add them before I had to take the photos. I will put them on before mailing the card though. My background was done using one of the new Ken Oliver colours that are now available in Linda's shop. This one is called Ultramarine. 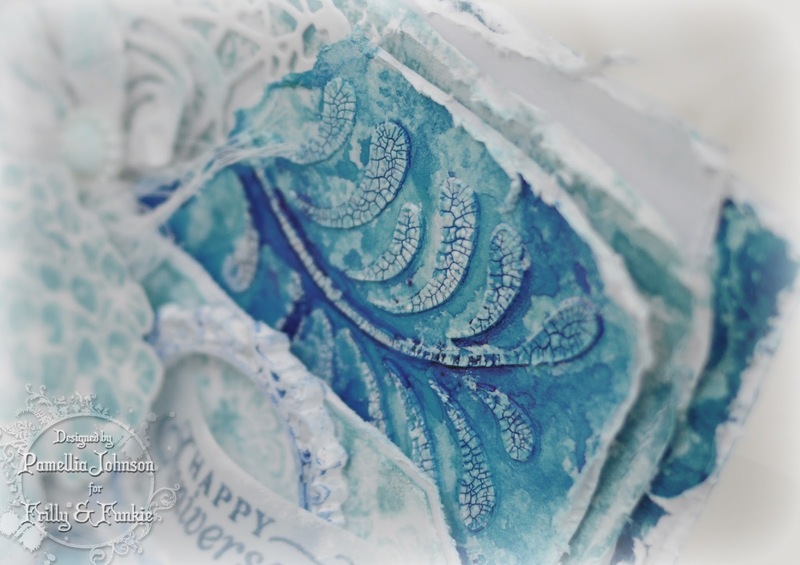 I laid down some Wendy Vecchi crackle paste through her Flourish stencil which I think looks like waves, and then dusted with Ranger fine detail embossing powder before adding the colour. For the deep blue layer, I spritzed a panel with distress ink Mermaid Lagoon and then splashed on a little water to get the drips and drops. The circles were made with the caps of my Mini-mister and Distress Ink Spray bottles. For the light coloured layer, I stamped the Tim Holtz script stamp from the Papillon set using Tumbled Glass, then I dripped some of the ink spray around the edges to make it look like water. The flowers stamps are Wendy Vecchi. I white embossed them and then coloured with Tumbled Glass and Mermaid Lagoon. The tag is Tim Holtz. I stamped it with the Distress Damask set in Tumbled Glass. The sentiment is from the Graphic 45 Time to Flourish stamp set. I stamped it using Archival Ink Cobalt Blue. The doily is from Prima. The gorgeous lace, the hidden white pearls and the bronze embellishment are all from Linda's shop. The small pearls and the bronze embellishment were coloured using Ranger Alcohol inks Stream, Sailboat Blue and Indigo. The leaves were cut from Sizzix Garden Greens.The frame was made with crafter's clay and lightly painted with Salty Ocean paint. This is a fantasic masterpiece of card! Love it! Your Niece will absolutely adore this Pamellia, it has such a lovely light, airy and summery feel to it and all so beautifully put together. 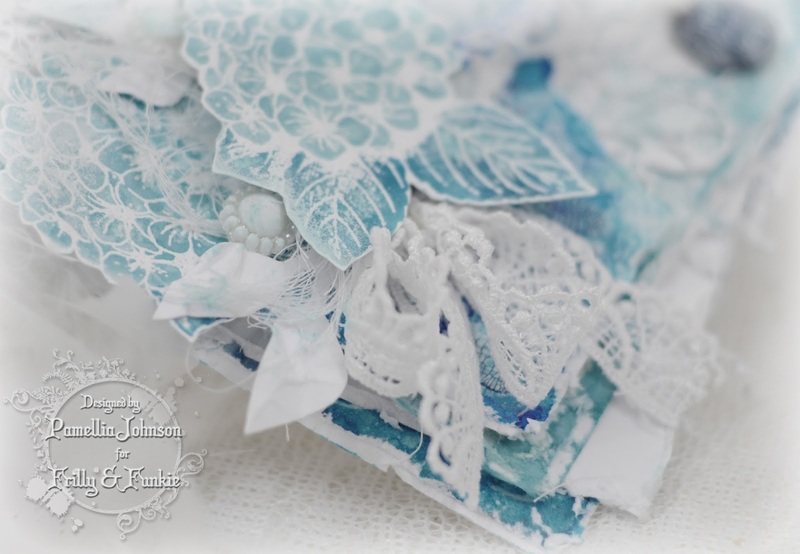 Fabulous - love all the layers of blues with the little touches of white, and so many details. Love it. It's a WOW from me too! This is stunning Pamellia. 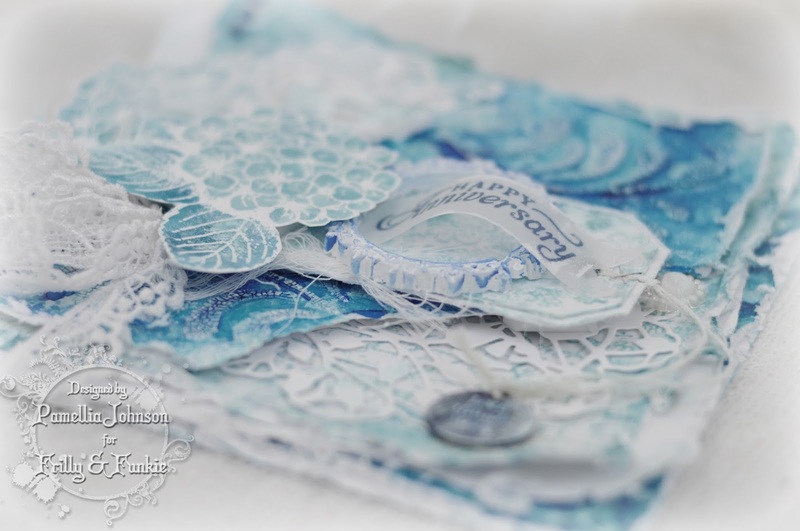 I LOVE the shades of blue you have used, gorgeous textures and amazing detailing. Stunning work!! Love the crackle and a great theme!! Oh my those colours are absolutely magnificent!! This is so beautiful! Your friends are sure to treasure this! Amazing use of just one colour, a beautiful and fresh feel to it which reminds me of a summer breeze on the beach and is sure to conjure up memories of your niece's wedding for her too. She will love it. Gorgeous use of blues ;) great minds...! I adore the light airy feel to your card and all those amazing details with the lace and the die cut doily underneath. This card is just perfect for your niece to celebrate her anniversary - she (and her hubby) will adore it!! A lots of WOOOWs for this stunner, Pamellia! 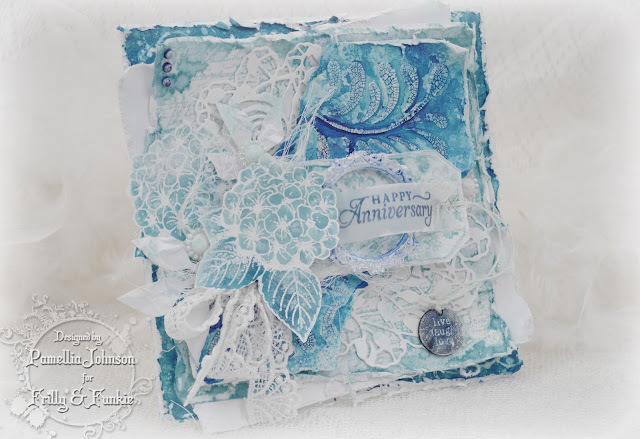 Fabulous use of blue shades and fantastic layering, as always! Amazing design with all those awesome details, so delicate and fresh! I wish I could make such a beautiful card! WOW! Pamellia, this is stunning Gal, such lovely colours of Blue, so beautiful, absolutely stunning. What a beautiful card, Pamellia! Your niece will love it! Please share another photo when you add the sanddollars. What a lucky niece you have, Pamellia, to be receiving this gorgeous creation. 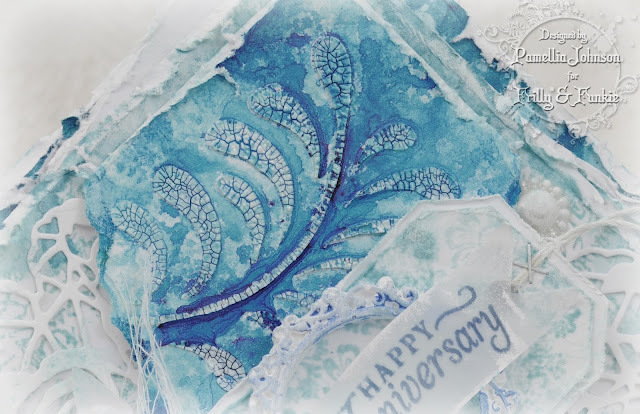 I so love all the different shades of blue, the different layers, the fabulous crackle effect, and all the beautiful embellishments. wow! 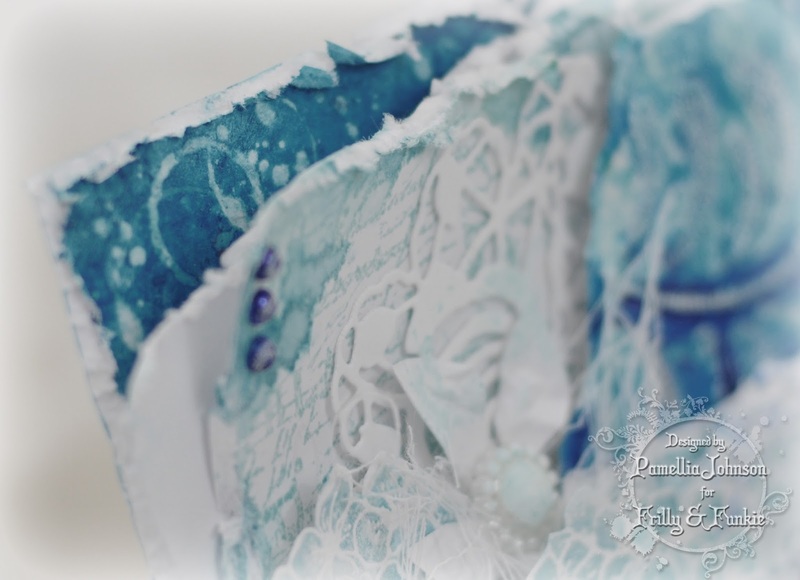 I don't know how you keep coming up with such stunning creations Pamellia, you have chosen such beautiful blues and there are so many fabulous layers and details - absolutely gorgeous. what a fantastic card Pamellia !! Awwwwww, my favorite color!!! I loooove blue and you used it so well on your stunning card! So many pretty layers, don't even know where to begin?!?! Sentiment on vellum :) yay, best way to go :) Love the little frame and such gorgeous texture!!! Bravo my friend!! Wow love shabby chic feel of this card with the soft blues and a hint of white . Lots of texture and layers so pretty . Gorgeous card Pamellia! Love the soft pretty colours...perfect for a beach anniversary! Thanks for joining the Sisterhood of Snarky Stampers for our "V is for Vellum" challenge!! P.S. I love how you tied the venise lace into a bow! I never thought of that! OH! your niece is going to love love love this card and I'm sure will give her happy memories too. Another stunning card, with all it's lovely lovely texture. What a gorgeous card for your niece! Pamellia, all these layers and texture equal so much richness and I love that crackle!! Beautiful work as always! Hugs! Love all the layers and texture on this blue shabby beauty. The cracked flourishes, hydrangea and vellum grab me the most. Gorgeous Pamelia, I love the colour, I'm not a blue person as a rule but this is such a pretty shade, the layers and textures, superb, love it! Are you doing a blog candy? Lol! Well, this has to be one of the prettiest cards ever. Beautiful shades of blue and lovely layers. Your niece will adore this. Won't join in the candy as I don't do Facebook but very generous of you. Love every single detail of your card Pamellia! What a gorgeous anniversary card! 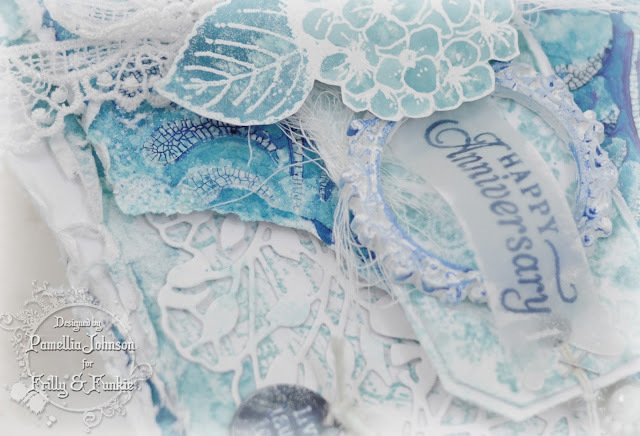 I love the varying shades of blue - and so many gorgeous details - it is absolutely beautiful! Your niece and her new hubby will cherish this! This is an absolute delight! Such a glorious array of blues, Pamellia! Your layers and textures are divine, as always! Your niece will be doing backflips over this beauty. Fantastic job on the monochromatic challenge! WOW this is gorgeous Pamellia! I love the monochromatic blue colors and the fabulous white embossing!! What a beautifull card, love the details ! Wow!! oh! Wow!! Pamellia, your card is stunning, so, so pretty. I just love everything you have done on it. Something to be loved and treasured forever. Hmmm - ok - soooooooooooo THANK YOU, THANK YOU Pamellia - for giving me a totally new perspective on the subject of the beach, the ocean, waves etc. Every time there is a challenge on that subject I get all stressed because I know nothing about it. I'm a lake girl! Only been to the ocean once or twice from a distance! But THIS - your INCREDIBLY FABULOUS anniversary card has totally changed my perspective. You are soooo right - it totally looks like waves and the colors are so like an ocean even without sand dollars - it's just WONDERFUL. Your niece will be thrilled. It will totally remind her of her special wedding day. 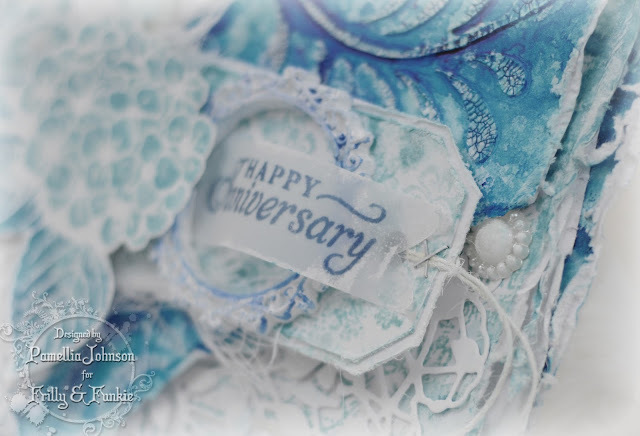 j.
Wow Pamellia, such a lush card and the way you have captured your blues and whites together to mimic the sea is so clever. Thanks for joining in the challenge at That Craft Place and good luck. I really don't think this could be any more beautiful. And the way you've used the flourish really is reminiscent of ocean waves! This will be an anniversary keepsake for sure. Thanks for joining the fun at the Sisterhood of Snarky Stampers! Oh girl, this is sooooo beautiful! Your friends will love this card! What a great idea to make it in marine/beach theme. Too bad the shells didn't come in time, I'd love to see what you would do with them (how you'd use them on the card) - whatever it is, I'm sure it's brilliant. each and every layer and detail, but my favorite are those crackly waves! Hydrangeas are the perfect picfk for a June anniversary card, since that is what blooms so prolifically this month, and I'm SURE that was no accident! You put so much thought into your marvelous creations! Big hugs, my friend! Pamellia, my incredibly talented friend, I cannot thank you enough for whisking me away to the ocean just now! :o) This is not only stunning, but so perfectly tailored to your niece... I really love that you did that. The colors are so dreamy and I am enamored with your waves! 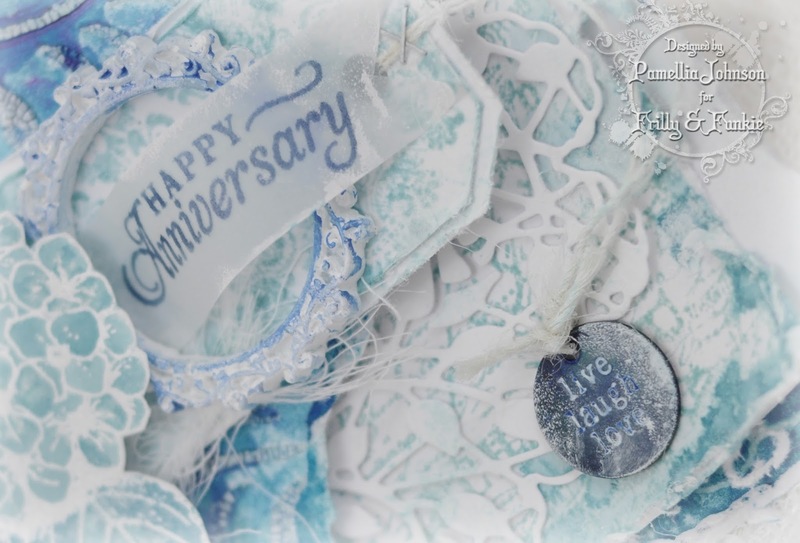 The Wendy Vecchi stamp is more beautiful than ever thanks to your creative heart. The Tim Holtz shades are gorgeous with the white embossing. This entire card is like a lovely dream! The layers and textures are second to none and I wish I had more words to express how much I adore your work. I'll be back later today to gush about your newest creation, which I couldn't resist sneaking a peek at before I have to go! ;) Thank you for forever inspiring us, my dear friend! Gorgeous Pamellia, what a beautiful monochromatic card, your niece is going to love it! Oh my days, this is absolutely exquisite!! Such effort has gone into this! Beautiful! This will be treasured for sure! Thank you for joining us for the challenge over on the That Craft Place Challenge Blog..
Oh, what a gorgeous card, it has a wonderful romantic, dreamy feel to it and I love the glimpses we get of the pretty little embellishments. I am sure this stunning blue and white card will take your niece back to her special day. What a beautiful card. The various shades of blue are stunning. Absolutely gorgeous. 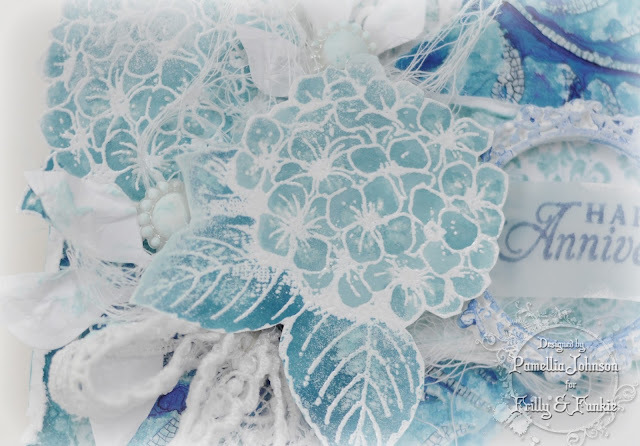 I love the lovely blue flower embossed in white and the lacy leaves. You are so talented. 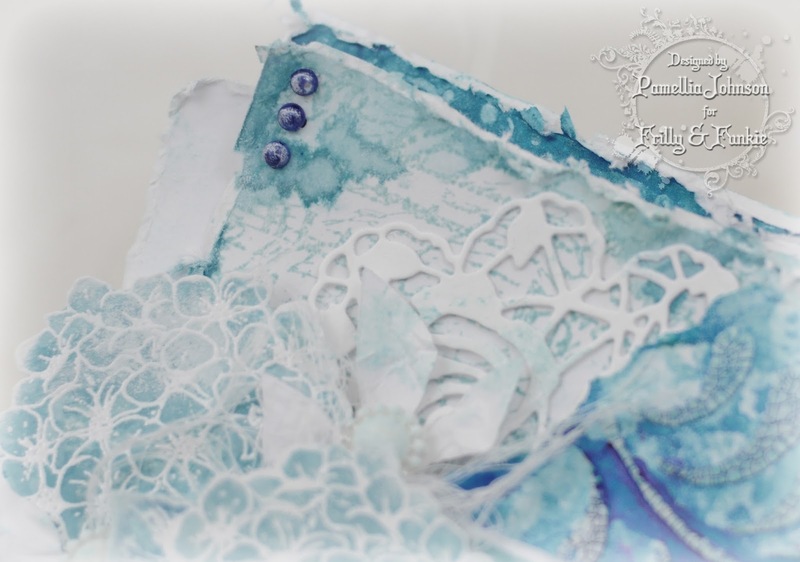 So delicately pretty, Pamellia - love the soft blues and lighter than air stamping and embellishing.